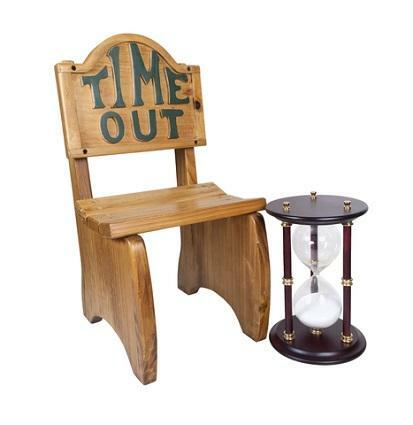 A time out chair can be an effective disciplinary tool to help children reflect on and learn from misbehaviors. What is an Isolation Chair? A time out, or isolation chair, can be any seat that is separated from other people for a specified period of time with the purpose of disciplining a child for wrong behavior. Although parents or caregivers can use any chair, bench, or other seating, some find it is more effective when a specific chair is designated only for the purpose of administering a time out. For young children, using designated isolation seating for discipline also avoids negative associations with other household activities - for example, a toddler who regularly receives time out in a dining room chair may associate negativity with meal times if s/he is required to use the same chair. My Bambino offers an affordable white child-sized chair for time out that can be personalized with your child's name. Apple ABC has a red bench-type seat available with "Time Out" engraved in the chair's back. Hayneedle offers a Sunny Safari time out chair that would coordinate well with a jungle theme bedroom. 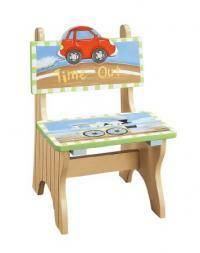 You can also buy a chair, stool, or bench and personalize the seat yourself with "time out" and your child's name. Using isolation can be very effective to manage children's behavior and teach them when done appropriately. As naturally social beings, children typically dislike required separation from others. It is also undesirable to children since privileges, such as playing with toys, are taken away during this time as well. Parents and caregivers should make the child aware of offenses that will result in a time out and be consistent with time outs when those behaviors occur. Time out can begin as early as 12 months and typically be used through elementary school. This type of discipline can work well in conjunction with other methods, such as behavior checklists or charts, games that help children learn discipline, positive reinforcement, and loss of privileges. Time outs should not be administered for extremely long periods of time. A good rule of thumb is to have the child receive a time out that equals one minute for each year of his or her age. A three-year old, for example, should receive a three minute time out for misbehaving. If the child gets up before the time out is over, gently pick up or physically guide the child back to the chair until he or she has served his or her time out in full. Explain why it was wrong. Give the child alternative choices for that behavior. Remind the child s/he will go back to time out if the offense occurs again. A chair used for isolation discipline should be placed in a safe, lighted area. Do not place the chair in the dark, as this could be extremely frightening, especially for very young children. Also avoid unsafe areas, such as bathrooms or basements, and any area that is typically off limits to the child (such as a laundry room where cleaning supplies are kept.) Many parents find that a corner or separated area of a central living area, kitchen, or dining room works well. Others find that bedrooms can work for older toddlers and young elementary schoolers (younger children may just get up from the chair and play when parent is not watching).